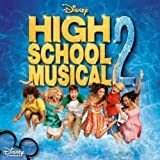 Accueil Produits Bande originale La bande originale de “High School Musical 2”. 1. What Time Is It – 3:20. 3. Work This Out – 3:04. 4. You Are The Music In Me – 3:28. 5. I Don’t Dance – 3:37. 6. You Are The Music In Me – 2:29. 7. Gotta Go My Own Way – 3:42. 8. Bet On It – 3:20. 10. All For One – 4:15.